Director/Producer – Roger Corman, Screenplay – Richard Matheson, Based on the Short Stories Morella, The Black Cat, The Facts in the Case of M. Valdemar and [uncreditedly] The Cask of Amontillado by Edgar Allan Poe, Photography – Floyd Crosby, Music – Les Baxter, Music Co-ordinator – Al Simms, Photographic Effects – Butler-Glouner Inc, Special Effects Supervisor – Pat Dinga, Art Direction – Daniel Haller. Production Company – American International Pictures. Morella:- Lenora returns home to see her father for the first time in 26 years. He blames Lenora for the death of his beloved wife Morella, who died giving birth to her. However, Morella’s ghost now comes to possess Lenora. The Black Cat:- Montresor Herringbone is a drunkard who has spent all his wife’s money, leaving them near penniless. He befriends Fortunato Lucrezi at a wine-drinking competition but then finds that Fortunato has started an affair with his wife. He takes revenge by poisoning the two of them and bricking their bodies up behind a wall in his cellar. However, he has reckoned without his wife’s black cat, which he has accidentally bricked up as well. The Case of M. Valdemar:- The mesmerist Carmichael is able to relieve the dying Ernest Valdemar’s pain through hypnotism. Carmichael has one last request – to conduct an experiment and hypnotize Valdemar just before he dies. He is successful and is able to keep Valdemar’s spirit imprisoned in his dead body. Suspended between life and death, Valdemar is in agony but Carmichael refuses all entreaties to release him. In the 1960s, Roger Corman had considerable success and found mainstream critical acclaim with a series of Edgar Allan Poe adaptations beginning with The House of Usher (1960). (See bottom of the page for the others in Roger Corman’s Edgar Allan Poe series, as well as his genre films). 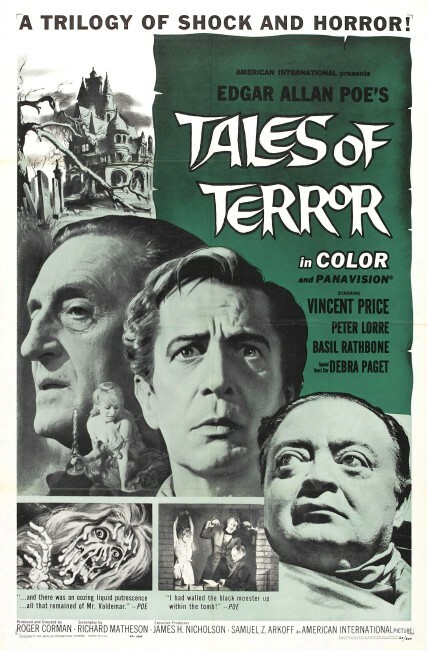 Tales of Terror was the fourth of these films. Here Roger Corman reteams with star Vincent Price, who appeared in all but one of the Edgar Allan Poe films, and screenwriter Richard Matheson, who wrote four of the films. With Tales of Terror, Roger Corman altered his approach slightly in that he had Richard Matheson adapt not one but three Edgar Allan Poe tales. (In truth, there are four tales – The Black Cat segment combines two Poe stories with Richard Matheson uncreditedly also using Poe’s The Cask of Amontillado ). This portmanteau approach is something that works well for Edgar Allan Poe. In all the other Roger Corman’s other Edgar Allan Poe films, the various scriptwriters have to pad a single Poe story out to feature length. Most Poe stories are a single effect without much even in the way of motivation – in all the other Roger Corman films, Richard Matheson and the other writers had to create an entire backstory to build up to the story’s single effect. An anthology film like this is something that allows Poe to operate in a form that requires far less story padding. The first segment Morella is the slightest of the stories. The story marshals all the cliches of the Corman Poe films – an old decaying house, an overwrought and obsessed Vincent Price haunted by the past, possession – the piece is like a dry run for The Tomb of Ligeia (1964) – and the house burning down at the end. There is one eerie image of a black ghost creeping up the stairs to the sleeping daughter’s bedside but the episode is otherwise forgettable. The best of the segments is The Black Cat, which seems like a dry run for the more overtly comic treatment of Poe that Corman, Matheson and this episode’s two stars Vincent Price and Peter Lorre would conduct with the following year’s The Raven (1963). 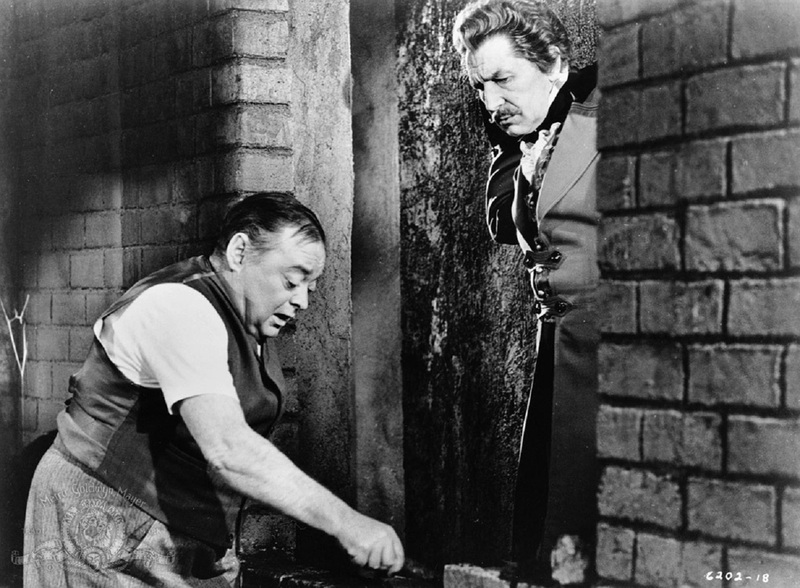 Peter Lorre gives an hilarious performance – the wine-tasting contest between he and Vincent Price is a comic gem. Not to mention the surreal vision of a dream sequence of Vincent Price and wife playing catch with Peter Lorre’s head. The Case of M. Valdemar effectively uses Poe’s single scene ending while padding it out with a full flight of “There Were Some Things Man Was Not Meant To Know” paranoia. 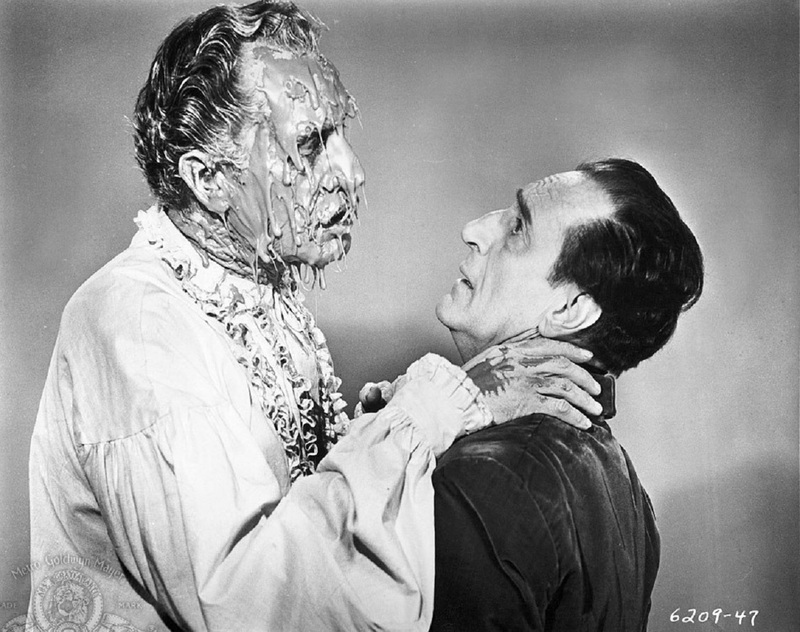 Here Basil Rathbone gives a wonderfully arrogant performance and Roger Corman builds fine atmosphere with the eerily gurgling voice, climaxing in a memorable deliquescing effect. Roger Corman’s other Edgar Allan Poe films are The House of Usher/The Fall of the House of Usher (1960), Pit and the Pendulum (1961), Premature Burial (1962), The Raven (1963), the Poe-titled but H.P. Lovecraft adapted The Haunted Palace (1963), The Masque of the Red Death (1964) and The Tomb of Ligeia (1964). The Black Cat and The Facts in the Case of M. Valdemar were also adapted in the Edgar Allan Poe anthology Two Evil Eyes (1990).